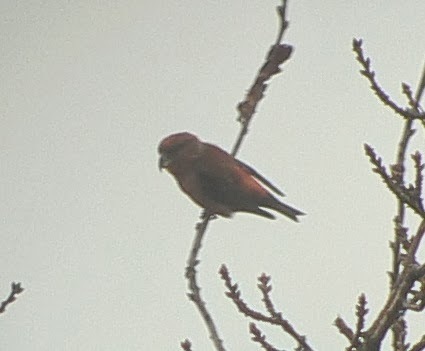 I arrived at Budby Common, Sherwood Forest at 8:30am, to be greeted with the cheerful news that the Parrot Crossbills I was hoping to see had just been seen on the ground drinking from puddles but had flown off seconds before I arrived on the scene. Great! I'd left home at 6am to get there for first light, because I knew that they were generally being seen early morning, and yesterday, for example, they put in just one appearance at 9am before going AWOL for the rest of the day. My mood wasn't helped by the fact that I'd been delayed by not one, but TWO roads closed, including most annoyingly, the M60.....at 6:30am on a Saturday morning! Unbelievable! 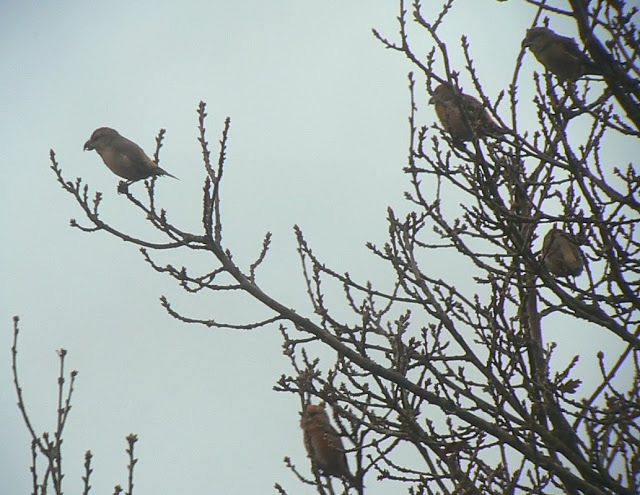 One of the local birders didn't help, by informing everybody as they arrived that he didn't expect the birds to be seen again all day. If I heard him say that once, I heard it a million times. SHUT UP! 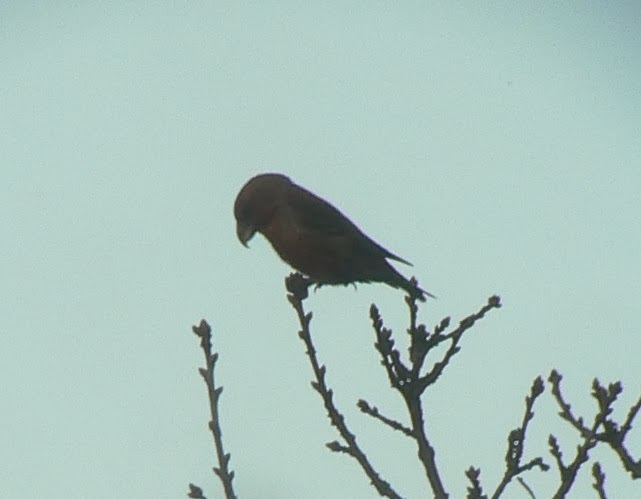 Anyway, he was proved wrong, because after about an hour a flock of 14 crossbills flew into a nearby tree, and the combination of huge bill, large head and stocky appearance confirmed that we were indeed in the presence of Parrot Crossbills. 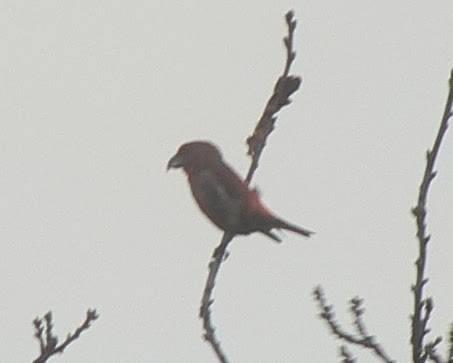 All crossbills are impressive birds, and this has been a great year for them, with plenty of commons and the biggest eruptions for years of Parrot and Two-barred Crossbills. 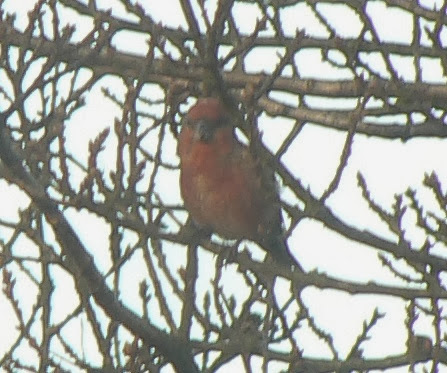 Male Parrot Crossbill. 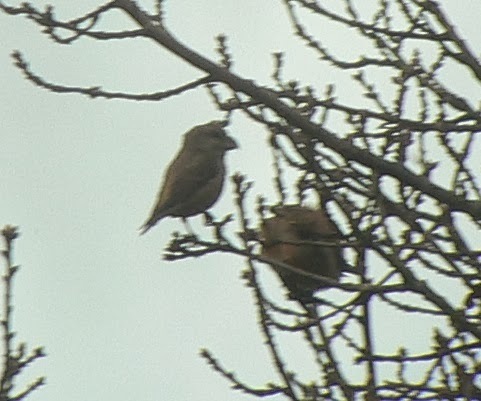 There's an interesting discussion here on the bill size of the Parrot Crossbills in the UK this year. Some of them seem on the small side for the species, whilst others are spot on. This bird actually had a heavier bill than it appears in the photo, I think that its head is slightly twisted towards us here giving it a false impression. Look at the size of its head though, and it's bull necked, stocky appearance. 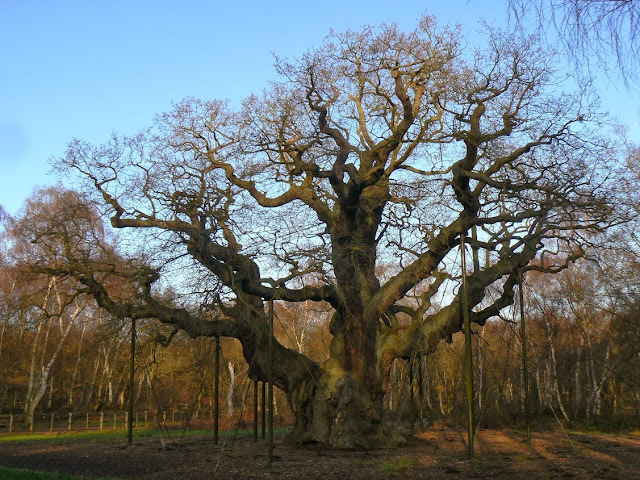 As a keen botanist, it's impossible to be so close to the Major Oak and not pay it a visit. This tree has a girth of 10m, and is estimated to be between 800 - 1000 years old, and was just a five minute detour from the footpath to the Parrot Crossbills.